Dregano Christmas Scene Schwibbogen Arch, Germany by Dregano at Two Clock. MPN: 202515. Hurry! Limited time offer. Offer valid only while supplies last. German Christmas Scene Schwibbogen Arch and there are the electric candles along the top and small lights at the base to give a 3-dimensional effect. 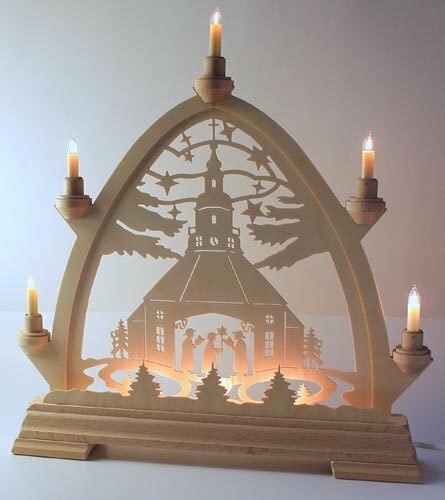 German Christmas Scene Schwibbogen Arch and there are the electric candles along the top and small lights at the base to give a 3-dimensional effect. This is all ready for American electricity. Measures approximately 17 inches high by 15 3/4 inches long. Includes light bulbs. Uses 16V 3W light bulbs (both candle and flame style). Made in the Erzgebirge Mountains of Germany.